HOBOKEN, New Jersey, December 31, 2013 (ENS) – Tigers are in trouble. The largest of the world’s cats, a species that’s existed for two million years, is slipping away before our eyes. Few realize that just 3,000 tigers remain in the wild. I just heard unofficial news that 100 tigers were poached in India in 2013. A century ago, more than 100,000 roamed 30 nations; today, they hang on in 12. Scattered in small pockets across Asia, they’ve disappeared from 93 percent of their former range. Without serious intervention, tigers could be exterminated from the wild within our lifetimes, though others will languish behind bars in captivity. Like all endangered wildlife, they face many threats. Asia’s exploding human population is leveling habitat and emptying forests of deer and other tiger prey, leaving the big cats little to eat. As villagers push deep into tiger territory, there’s inevitable conflict. Tigers – especially elderly cats or mothers with cubs – sometimes kill a cow, buffalo or other livestock. When they do, villagers often retaliate. The cat’s current precipitous decline began in the 1980s with a wave of poaching across their range. At that time, an appetite for animal parts used in traditional medicine skyrocketed in tandem with China’s expanding industrialization – and a growing middle class with money to spend. For millennia, medicine men have ascribed magical powers and healing properties to tigers. The cats are seen as a universal apothecary. Nearly every part, from nose to tail, is used to treat something: joint, skin and kidney problems, baldness, laziness, fevers, possession by evil demons, flagging libido and headaches. Today, the most crushing demand is for tiger bone wine, a tonic thought to impart the animal’s great strength, made by soaking a tiger skeleton in rice wine. Vietnam, Laos, Thailand and other countries also trade in tigers, but their consumption pales in comparison with that of China, where there is also a growing luxury market for tiger skin furniture. Despite an international treaty that bans tiger trade, there’s a thriving black market. In testimony before the U.S. Congress in 2008, INTERPOL agents detailed how organized crime syndicates mastermind the wildlife trade – the same cartels that run gun, drug, and human trafficking operations. Wildlife trafficking is a $20 billion a year business, with criminal gangs killing precious wildlife to supply the Chinese medicine market. Police and customs agents make some arrests and seizures, but few poachers or smugglers see jail time. In India, for example, there is a three percent conviction rate for wildlife crime. The good news: there is still enough habitat to support healthy tiger populations. Tigers can thrive with just the basics: food, water and a place to live. Add boots-on-the-ground protection – wildlife reserves need patrols for the same reason that cities need police – plus strong laws that prosecute poachers, monitoring, and incentives for communities that live with tigers, and the animals bounce back. 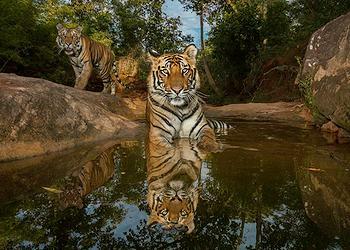 We need to save tigers because of their sheer majesty. But there is also a much broader reason to stop their slide towards extinction. Saving tigers will help us save ourselves. Preserving huge tracts of forest, wetlands, and jungle for tigers has positive impacts that radiate outward with global implications. Those forests pull carbon from the atmosphere and slow climate change. They provide buffers against flooding, protecting towns and cities, and preventing erosion of the rich soil needed to grow crops. Forests purify the rivers that run through them, providing drinking water for millions of people. By saving tigers, we save the entire spectrum of life that shares their realm, preserving ecosystems that have been fine-tuned over millennia. We still have time. Where there’s life, there’s hope. But the time to act is now. Once the last tigers disappear, no longer gliding on velvet paws through the jungle, we cannot bring them back.